"What do you mean you don't have it?" Dominick Spencer, the Duke of Tremayne, slammed his fist on the desk, rattling the tea cup perched on its delicate blue and white china saucer. "I'm s-sorry, Your Grace," the agent stammered, shrinking back as though he wished he could blend into the wood paneling of the duke's London town house. "I have exhausted every avenue—"
"Damn and blast your every avenue." Dominick stood and stalked around the large oak desk that had been his father's and his grandfather's and his great-grandfather's before that. "You didn't exhaust every avenue, or you'd have the book in your hands by now." "Yes, Your Grace." The man hung his head, staring down at the hat he had crumpled in his hand. "I will keep trying—"
Dominick waved an arm. "Get out." The agent looked up quickly. "Get out of my library and my house, and while you're at it, get out of my employ. Mr. Jones, you are relieved of your position." Dominick took two more menacing steps. He was a large man, three or four inches over six feet, with brawn he had cultivated from fencing, pugilism, and riding. He did not drink spirits. He did not gamble. He did not socialize. He had a half-dozen estates to oversee and thousands of tenants, servants, and others relying on him. The Duke of Tremayne was one of the most powerful men in England, and he ruled his dominion with an iron fist. Either an employee did as he or she was hired to do, or he was out. Dominick glared down at the agent. "I don't bloody care what your name is. You are through." He pointed to the door, and Jones or Jarvis or whoever the hell he was scurried out. As soon as the agent was gone, Quincey entered. The secretary was a man of about sixty, of average height and build, with white hair and small, round spectacles. He knew not to speak until addressed, and so he waited patiently while Dominick leafed through several papers on his desk. They were in a neat stack precisely in the center of the desk and arranged alphabetically. He found the one he wanted easily and removed it, straightening the stack again before turning to his secretary. "Tell Fitch I want my hat and coat." "Yes, Your Grace. Shall I inform the butler you will not be dining at home? He will want to notify Cook." Dominick waved a hand without looking up from the paper. "Fine." He didn't care about food. He cared about the book. He and two other members of the Bibliomania Club had pledged to find the four volumes of a manuscript known as The Duke's Book of Knowledge. Dominick didn't need another book. He had a library full of rare and extraordinary books, as did the other members of the club. They were all collectors, usually in competition for the ancient volumes. But this was not about his own library. Not this time. This was about Professor Peebles, who had been his instructor at Oxford. Peebles's literature class had inspired Dominick's love of rare and unusual books. And for as long as Dominick had known the professor, he'd been searching for The Duke's Book. 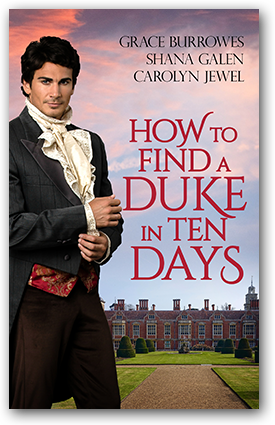 Now Peebles was an old man and ready to retire, his one regret that he had never found any of the volumes of The Duke's Book. Three members of the Bibliomania Club, Peebles's students at Oxford, had agreed to find the four volumes, and they planned to present them all to Peebles on the eve of his retirement. Even now, Viscount Daunt or the Earl of Ramsdale might have a volume of the manuscript in hand. Dominick had nothing, and the professor would retire in a little more than a fortnight. "Is there anything else, Your Grace?" Quincey asked. "Yes." Dominick folded the paper neatly and slid it into his pocket. "Make a note that I have fired Mr. Jarvis." "Yes, Your Grace." Quincey's lined face betrayed no emotion. "I assume Mr. Jarvis did not manage to find the volume." "He did not. It appears if I want something done, Quincey, I will have to do it myself." "Your Grace?" Now Quincey's brows rose, and he managed to look both composed and slightly alarmed. "That's right, Quincey. Jarvis is the third man I've hired, and not a one of them has found the volume. I don't have any time left to waste. Have Bateman pack me a valise. Tomorrow I leave to find the volume on my own." Once at the club, Dominick climbed the wide stairs to the second floor, which housed a drawing room, where the members often met to discuss their acquisitions, and an extensive library, full of books about... well, books. This was the room members visited if they wanted to research a particular book to ascertain its value. Some books were valuable because of their content. Others were exceedingly rare. Still others were not so rare, but were volumes any bibliophile worth his salt would have in his collection. Dominick opened the door to the research library and inhaled the smell of leather, ink, and old parchment paper. It was an intoxicating scent. The room was dark, as no fire or sconces were allowed inside, and Dominick took a lamp from the table just outside the doorway, lit it, and stepped inside, closing the door after him. He set the lamp on the polished oak table in the center of the room and strode to the medieval section of the library. The Duke's Book of Knowledge had been commissioned by Lorenzo de' Medici in the fifteenth century. The volume Dominick sought was filled with arcane medical knowledge. He had consulted experts in the field, but thus far, all of their suggestions as to where the medical volume had been hidden had proved fruitless. He pulled a book off the shelf, one he had perused many times, and read silently under a section titled The Duke's Book of Knowledge. ... secretly commissioned book of knowledge to be assembled from the greatest scholarship, written in a fine Italic hand by a team of Florentine scribes, and illustrated by great artists. Very few eye-witness descriptions of the book exist. Dominick skipped ahead. He didn't care where the eye-witness descriptions might be chronicled. He knew those descriptions from memory at any rate. There were four bound volumes, each with a Roman numeral on the spine. His finger slid down the page. Dominick knew all of this. He replaced the tome and pulled down another. This one stated that the Villiers family, Buckingham's surname, did not possess the manuscript upon the duke's death. The scholarly author suggested the four volumes had been dispersed. "Oh, I beg your pardon, Your Grace. I did not mean to intrude. Just making my rounds." Dominick glanced over his shoulder at the elderly man in the doorway. "You are not intruding, Mr. Rummage. In fact, I am just about through here." Rummage, who served as the club's Master of the House, had been in that position ever since Dominick had joined. It was impossible to tell how old the man might be. He could have been sixty or eighty. His hair was gray and rather unruly, sticking up at all angles. His beard was just as bushy, but his watery eyes were sharp and keen. He was a tall, thin man, who dressed in black and who seemed to wander but always managed to be where he was needed. "Did you find what you were looking for, Your Grace?" "Might I be of assistance?" Dominick almost shook his head, then reconsidered. Rummage had been here a long, long time. Mightn't he have overheard a conversation or perhaps read a passage in one of these books that could be useful to Dominick? "What do you know about The Duke's Book of Knowledge?" Dominick asked. "Professor Peebles's manuscript?" Rummage stepped inside the room and closed the door behind him. "I know there are several of you searching for the volumes. You seek the medical volume, do you not, Your Grace?" "I do, and I'm having a devil of a time finding it." "I can well imagine, Your Grace. That's the one—well, I doubt I can be of use." But Dominick had seen the hint of something in Rummage's eyes—a memory that caused a flicker of a smile and a slight crease in the older man's brow. "I would not be so quick to dismiss you," Dominick said. "Come. Sit with me a moment and tell me, do you recall ever hearing anyone speak about The Duke's Book, specifically about the volume on medical knowledge?" Dominick took a seat at the oak table, but Rummage remained standing. "I don't think it would be proper for me to sit, Your Grace, but I will say that I remember many, many conversations about The Duke's Book. The professor used to speak about it at length." "Yes. I've consulted him, and I've had every location on his list searched to no avail. There must be somewhere else." He resisted the urge to scrub his hand over his tight jaw, which he assumed was darkening with stubble by this hour of the night. "Then it wasn't in that old keep on the Cornwall coast?" Very deliberately, Dominick straightened. "Cornwall, you say?" "Yes. The Temples. To hear the professor talk about it, it sounded like a setting from one of the Gothic novels the ladies like to read. It always seemed more like a myth than a possible location for The Duke's Book." Myth or not, Cornwall was not one of the locations Dominick had searched. "But you did search The Temples, Your Grace?" "No, Mr. Rummage, I have not. And now, I insist you sit right here and tell me all about it." He held up a hand. "Do not argue. I will call for tea, and we shall take our time going back over the conversation as best you recall it." "Yes, Your Grace." Rummage sat, and Dominick went to the bell-pull to summon a servant. The Temples. This was it. He could feel it, the same way he knew when a horse was of the best stock or an investment was sound. Dominick believed heartily in books and documents and research, but there was something to be said for instinct as well. The Dukes of Tremayne had been famous for their instincts for centuries. Instinct was how they'd known who among their vassals were traitors, which side of the War of the Roses to fight on, and which women to take to wife to ensure the bloodline. Dominick trusted his instincts, which meant The Temples was where he would find that lost volume. Miss Rosalyn Dashner had been called a cat more than once in her life. She'd first climbed out of her crib at the tender age of ten months, whereupon she then proceeded to crawl across the room and claw her way onto her toy box to retrieve the doll she wanted. Her nanny had returned to the nursery to find her charge scaling the railing to return to her crib. And this was before Rosalyn could even walk. As she grew older, she climbed bookshelves, trees, and even a trellis or two. But by the time she was fifteen, she was no longer climbing for fun. Her father had died, leaving her mother and her three siblings in dire straits indeed. Then Rosalyn's youngest brother, Michael, had become ill. The cost of doctors and medicines had been exorbitant. The once genteel family had fallen deeper and deeper into debt. They'd had to sell their small country house and move to the unfashionable Cheapside area of Town. Rosalyn did not mourn the move. She adored London. London was alive. It reminded her of an enormous beehive that had hung from a tree on the path she liked to walk back in country. When she'd been five or six, she barely noticed it. But by the time she was twelve, the hive was so large it bent the branch on which it hung. Rosalyn had worried that a stiff breeze would send it tumbling to the ground, angry bees swarming about. That was London. Year after year, it seemed to grow and expand until it became so dense and so large the mass of people within could barely be contained. And just like that beehive back home, London buzzed and hummed with constant activity. Rosalyn never felt alone in London. There was always someone awake and about, and usually their intentions were as dishonorable as her own. But now that summer was upon them and with it warmer days, tempers were shorter and foreheads damper. It seemed everyone was on edge, waiting for that stiff breeze that would dislodge the hive and catapult the city into violence. Rosalyn had seen it before—brawls that turned into riots, riots that created mobs. London was woefully unprepared for such lawlessness. There was no centralized police force, and the watchmen snoozed more than they patrolled. Rosalyn had long thought she was fortunate to be a cat. Cats could tiptoe away when violence erupted, looking down on it all from the safety of a high branch. Her branch tonight was the roof of Thomas & Sons on Canterbury Lane. Her older brother, Stephen, was beside her, lying on his back and smoking a cheroot, the smell of which reminded Rosalyn of her father's pipe. Stephen was more of a raven than a cat. He had sharp eyes and could pick a lock as though he'd been born to it. With his light brown eyes and dark black hair, he perched in shadows and moved through alleys so quickly it seemed he flew. Daniel, on the other hand, could neither slink nor fly. He was a year younger than Rosalyn, and the two were often mistaken for twins. They both had dark hair, like Stephen, but their eyes were green, not brown. Rosalyn was shorter than Daniel, but Daniel was shorter than Stephen. Daniel and Rosalyn were both thin and wraithlike. Rosalyn used her small body to advantage, slipping into spaces most adults could not manage and hanging on pipes or clotheslines that would have bent or broken if someone with more weight had relied on them. But for all the grace she had been given, Daniel had only awkwardness. He was gangly and clumsy, forever knocking over small tables and breaking Mama's few remaining china plates. For this reason, Daniel served as lookout, loitering below the shop, ready to signal when the shop owners had finished locking up for the night or if the watch happened by. "It shouldn't be long now," Stephen said, blowing smoke into a sky already gray from coal fires. "Not long," she agreed, peering over the edge of the building to keep her eye on Daniel. He slouched against a shop across the street, hands in his pockets, looking half asleep. But she caught the glint of his green eyes under the brim of his hat. He was alert and ready. "You know what you're after?" She glanced at Stephen, annoyed to find his dark eyes fixed on her. "If you mean, do I remember how all of you voted against me, the answer is yes. I lost. No jeweled cameo. Instead, I'm to swipe a simple silver chain." Even she could hear the bitterness in her voice. "We can sell the chain easily. Any of the popshops will take it. They can turn around and sell it again the next day. Who do we know that will have the blunt or the customers to pay for a jeweled cameo?" Rosalyn had heard this tedious argument before. Stephen was probably just as tired of her response. "Then we find a buyer for the cameo. Or, forget the cameo. When I cased the shop last week, I saw rings and brooches. I could swipe one of those. We find the right buyer, and we're done thieving for a year or more." Stephen raised a brow at her. "And here I thought you liked thieving." She did like it. "That's not the point. Mama does not approve, and she's probably right. No matter how good we are, eventually we will be caught." "You mean Danny or I will be caught. It would take another cat to catch you, Ros." He tousled her hair, which she'd pulled back into a long tail and tucked under her coat. She wore men's clothing because it was easier to move in. She'd often thought she should chop her hair off so she would not have to worry about it getting in the way or spoiling her disguise, but her hair was the only womanly thing about her. She was otherwise as thin and straight as a boy. "I don't like to worry about you and Danny, but I also miss having some security. Having a little money would buy us security." "And taking something that valuable would hurt the shop owners. They'll hardly miss a silver chain, but a ring worth thirty pounds might mean they go out of business. I hardly want to get rich by stepping on the backs of others trying to earn an honest living." Rosalyn sighed. How could she argue with that? She had always been inclined to take the every-man-for-himself view. But she had gone in the shop, and the older gentleman who had offered assistance had been very kind. She didn't want to see him unable to pay his rent or feed his family. "Fine." She peered over the roof again and then ducked back just as quickly. Danny was consulting his London guidebook, which was her signal that the owners were about to depart. "He has the guidebook," she whispered to Stephen. Stephen stubbed out the cheroot and rolled onto his belly. Both of them listened intently to the street noise below. Gradually, she heard the jingle of bells as the door to the shop opened. The passing carriages and general hum of the hive that was London kept her from hearing the actual clicks of the keys in the locks, but she could imagine the sound. Then, after at least ten minutes had passed, she rose up on her elbows and peered over the roof again. Daniel had put his guidebook away and was setting his pocket watch. She and Stephen knew the watch did not actually work, but it was a convenient signal. The shop owners had departed. "Still too light," Stephen said. "I hate these long summer days," she replied. She'd loved them when she'd been young and carefree in the country. She'd been able to go for long walks after dinner down to the pond or the stables. But now that life had ended, long summer days meant waiting for the sun to creep low enough that she could melt into the shadows. And so much for dinner. Her mother would have some broth waiting for them when they returned. Perhaps bread as well. But it would barely quell the rumbling in her belly. And if she was hungry, she could only imagine how much worse it must be for Stephen, who was bigger and taller than she. But the sacrifice was worth it for Michael. Sweet little Michael, who had been so ill and whose medicines and tonics and doctor's calls were so very expensive. Michael was fourteen now, but he looked much closer to the age of nine. He was so small and so pale. Rosalyn would have given her brother all of her dinner if it would have made any difference. But nothing seemed to help. She did not like to admit it, but her brother was growing worse, not better. Rosalyn did not like to imagine life without Michael. Shaken out of her dour thoughts by Stephen's voice, Rosalyn peered over the edge of the building and looked down. Indeed, the streets were gray and shadowed. She could barely discern the glow of Danny's cheroot. She looked at Stephen. "Pull out the rope."